There are some brands that exemplify Americana. Levi's for workwear, Jack Daniel's for whiskey, and the company we're talking about today—Fender guitars. Beloved by some of the most rock and roll people ever to grace the planet, Fender has been making guitars for the better part of a century. 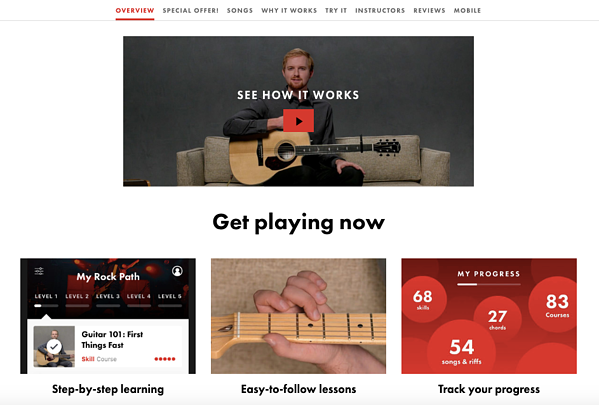 Now they're getting into the subscription economy with their educational app, Fender Play. In this week's Pricing Page Teardown, Peter and I dig into the first-ever subscription offering from Fender, looking at how willingness to pay and feature preference factor into the pricing strategy of this classic American brand. For a company that is the epitome of cool and rock and roll, they do a pretty good job of monetizing their software. But there are still a few opportunities to optimize the experience. Fender Play is a supplement to an already booming business, and it's a really smart way to monetize something that previously relied on a network of partners. Their main business is contingent on customers understanding not only the value of their product but how to use it as well. Fender Play takes their thousands of guitar teacher partners and basically cuts out the middle man, bringing everything into the digital age. When you land on their homepage, it's clear that Fender knows how to nail the right value propositions. They show the customer how the app works as well as what it includes right off the bat. This value-driven approach is all centered on the idea of pushing people towards signing up for a Free Trial, which drops them into a page that outlines their straightforward pricing tiers. With just two options, Fender doesn't have a lot of space to break out the differentiable features, and in my opinion, they could do a lot to change that. Coming from the super-clean and easily understood home page, the pricing page doesn't provide a whole lot of additional information. The monthly plan is a standard $9.99 a month with a discounted annual plan at 25% off for a total of $7.50 a month. While they do differentiate the fact that annual plan members get 10% off Fender gear purchases, the $89.99 billed annually call out should definitely be accentuated more. By differentiating that annual plan and showcasing the additional value for the customer more clearly, Fender could potentially boost the number of customers who opt for that higher-retention annual tier. It's a win-win situation for both Fender and the customer. 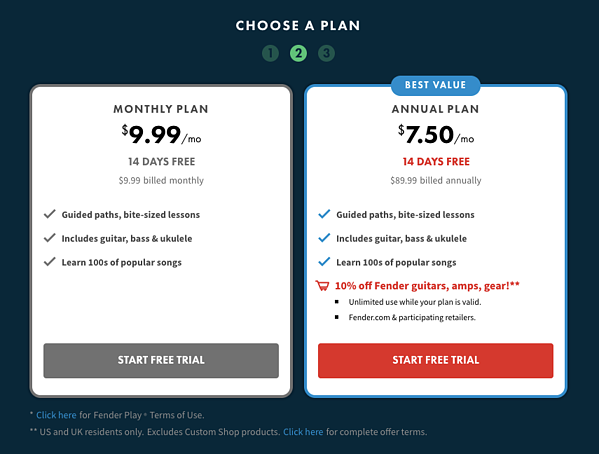 Right now, Fender Play's pricing flow is really simple and straightforward. While that's a good thing in terms of usability and conversion, optimizing that experience with some additional options or premium add-ons will definitely increase the potential expansion revenue per customer. Their customer base is potentially full of younger, less experienced guitar players who are in the moment and primed for upsells. This, combined with some of the trends we see in the data, shows some serious opportunities for boosting annual revenue per user (ARPU). 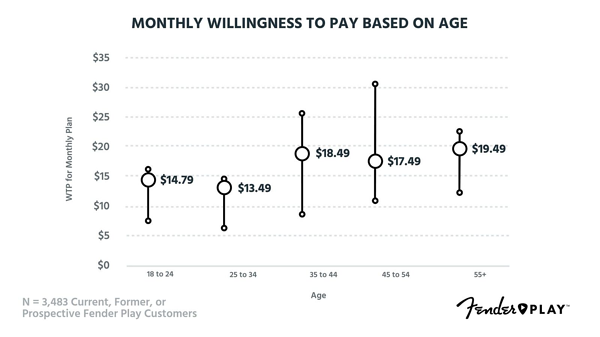 Take a look at the average overall monthly willingness to pay based on the age of the 3,483 current, former, or prospective Fender Play customers we surveyed. Even at the low end of things, in the 18 to 24 and 25 to 34 ranges, we see the willingness to pay at $14.79 and $13.49, respectively. That's certainly higher than the $9.99 monthly plan that Fender Play currently offers, and we only see it climbing higher as customers get older. While the 35 to 44, 45 to 54, and 55+ age ranges aren't necessarily going to be the target market for a guitar-learning app, there is likely a lot of overlap from parents who want to purchase the product for their children. Fender could conceivably boost the monthly tier to $14 or $15 without any backlash from potential customers. This would make the annual plan even more enticing, especially if they start thinking more strategically about discounts and feature differentiation. It could also be that Fender is using their new app as the ultimate lifetime value (LTV) play. By pricing lower than the projected willingness to pay, they're increasing the number of people learning guitar, which increases the number of people buying guitars. Bringing customers into the Fender ecosystem early on means the potential for more people to buy Fender guitars and gear over the next 60 years. With an increase in their monthly plan, getting customers onto the annual plan could really help boost retention. This helps open up opportunities for how Fender Play differentiates that plan as well as how they offer discounts to potential new customers. As a consumer product, steep discounts can be super valuable to get people onto that higher-retention plan from the start. The traditional way to discount would be through sales or holiday offers, but when we take a look at the data, there are definitely some interesting opportunities in terms of discounting by primary music preference. 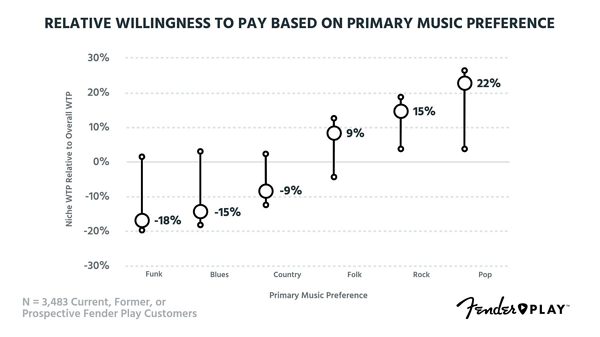 We found that different genre preference had a direct effect on the overall willingness to pay for Fender Play customers. Those people who are interested in learning how to play more old-school styles like Funk or Blues have the lowest relative willingness to pay as opposed to people wanting to learn Rock or Pop. With a -18% and -15% willingness to pay, respectively, people looking for Funk and the Blues aren't really going to be the target customer, even Country is pretty low with -9%. That's not really too surprising as the Blues and Funk tend to attract more experienced guitar players without the need for an educational app. Where Fender can really differentiate is in the Folk, Rock, and Pop genres. The customers looking to learn these styles of playing will likely be more in the beginner category. We see some opportunities when it comes to feature differentiation as well. Song Lessons are definitely the bread and butter of Fender Play, sitting squarely in the Core Features quadrant, but we see other types of lessons shifting a bit towards Add-Ons. With Riff Lessons and Skill Lessons just over the line in Add-Ons, there's definitely an opportunity for Fender to think about setting up some premium content related to those topics. While not everyone is going to want to learn their scales and arpeggios right off the bat, there's definitely some customers who are willing to pay for it. 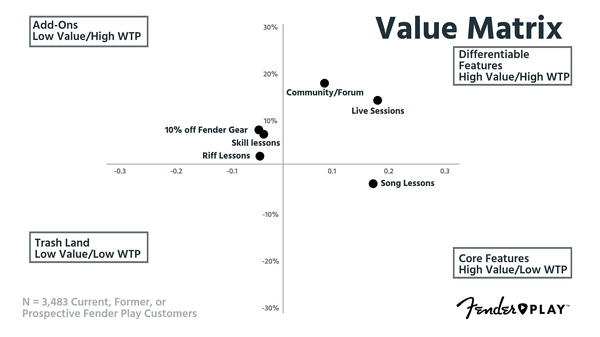 Where Fender really misses out is in the community aspect of their product, which we can see in the Differentiable Features quadrant. Their customers are interested in access to a Community Forum and the option for Live Sessions with an instructor, which makes a lot of sense—music is definitely a communal pursuit and being a one-stop shop for learning and collaboration would set Fender Play apart from their competition. With a bit more focus on the kinds of features and genres their customers are willing to pay for, Fender could easily start niching out their product offering a bit more. This would differentiate their brand and widen the potential market for new customer acquisition. As an already established brand with a lot of cultural clout and loyal customers, Fender could definitely switch up the way they think about pricing for the Play app. Peter gives their pricing a 7.0 and would actually consider becoming a customer if he had the time to devote to practice. I'm going a bit lower with a 5.8 because they're missing out on a lot of optimization opportunities. With a higher relative willingness to pay on age, they could definitely continue to win by upping their monthly price to $15. That would not only net them higher ARPU on average but help to differentiate their annual plan as well. Discounting based on genre and creating add-ons based on feature preference are both good options as well. It would potentially complicate Fender Play's simplified pricing strategy, but as an older brand, they have the ability to test a lot more easily than a new product on the market.